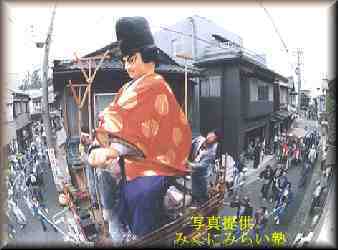 Have seen you Dashi (a festival car) of Mikuni festival? . The scene that warrior doll Dashis of 6 unit leaves for the front of Mikuni shrine one after another from 1 o'clock p.m., is worth seeing. Please visit Mikuni-Town on May 20 (the middle day of Mikuni festival) by all means. 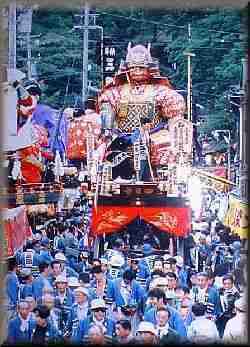 It processions Mikuni festival Dashi in 1997 became suspension halfway. It is because it began to rain from daytime, when I was playing a Japanese bamboo flute in the float of a Dashi. Rain has fallen from a ceiling of the float, it has fallen one after another, the drop is prevented with some towels and a vinyltape, but there was not the limit. Children of drums responsibility wore a vinyl waterproof. And children beat drums, so that they also does not get wet vinyl sheet was applied to a downpour beginning of rain. And the skin of a Samisen(Japanese guitar) has got broken when it gets wet to rain, because it is made of the skin of a beast. With it I cared about so that a Samisen does not get wet. It was not condition where ohayashi(festival music) is able to play in the float and rains strong after all. We descend from a Dashi and asked to cause shelter from rain in the home of neighborhood. Of course the persons who trail a Dashi also got wet by rain. With the reason they trail the Dashi, Hayashi-kata(accompanist) be not getting on in the area of themselves and others and returned. But, because it became drizzle when Dashi returns in their area and paraded only within its area with the performance of Hayashi-kata excpet Samisen Even at this time, the place where float sits was getting wet with rain. With it, we were condition which not able to be sitting and settle. 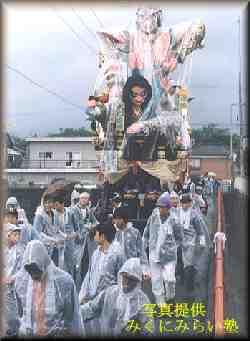 I am sorry but procession Mikuni festival Dashi in 1997 as above, procession the suspension of halfway became for the rain. This event is a nonexistent case for dozens year. A doll mentor who makes Musha-Ningyo(warrior doll) on Dashi, is hairdress business in Mikuni. He is only person who can make them, and his son is helping doll production now. Almost quarter's request it to him, Daimon quarter, for example, Musha-Ningyo("SONGOKU" in this year) was made by youth group of the quarter. Musha-Ningyo production is linked until the time of WATARIZOME(this is within each own quarter to procession with each Dashi before Mikuni festival.) from following the request of production in January every year. The doll mentor have finished 4 bodies Musha-Ningyo by the time in May in this year. It wrote on the basis of information that I (Kuni) was able to know regarding this Musha-Ningyo production.